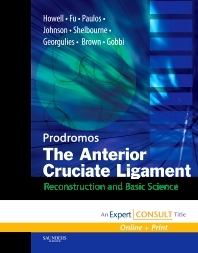 Master the very latest clinical and technical information on the full range of anterior cruciate ligament reconstruction techniques. Both inside the remarkably user-friendly printed version of this Expert Consult title and on its fully searchable web site, you'll find detailed coverage of hamstring, allograft and bone-tendon-bone (BTB) ACL reconstruction (including single versus double bundle techniques), and hamstring graft harvesting; plus fixation devices, rehabilitation, revision ACLR surgery, and much more! Surgical technique videos on the bonus DVD help you hone and refine your skill set under the expert guidance of the leading authorities in the field. A "dream team" of ACL surgeons provides the advanced guidance you need to overcome the toughest challenges in this area. A comparison of the full range of graft options for ACL reconstruction makes it easier to choose the best approach for each patient. State-of-the-art information on the latest principles and technical considerations helps you avoid complications. ‘How to' principles of post-op rehabilitation and revision ACL surgery optimize patient outcome. The bonus DVD helps you hone and refine your surgical technique under the expert guidance of a "who's who" in ACL surgery. Access to the full contents of the book online enables you to consult it from any computer and perform rapid searches. Also available in an upgradeable premium online version including fully searchable text PLUS timely updates. 21. Femoral Tunnel Placement to Restore Normal Knee Laxity After ACL Reconstruction – Andrew A.